Raymarine SeaTalk NG Power Cable A06049 / 4001-171-D. Some are still in original poly bags, but some are bulk packaged for ease of use as they were often used on installs. All are new and still have cable sheathing. Trending at $11.29eBay determines this price through a machine learned model of the product's sale prices within the last 90 days. Transom Mount Bracket for CPT-DV & CPT-DVS. CPT-DV/CPT-DVS Mounting Kit. Working Raymarine E120. Has a small crack in the lower right corner of the bezel. The cover and power cable are included. Removed during an upgrade. DSM300 model HS / Power cable. Unit works and includes one NG cable and cover. This is just the unit. the box and anything that was in the box was tossed out. Raymarine DSM300 Digital Sounder Module. Condition is Used. Taken off my boat to make way for new electronics. Working condition and in good shape. Used and works perfect. Used only in fresh water environment. They all use SeaTalk communications on a 3 wire cable. 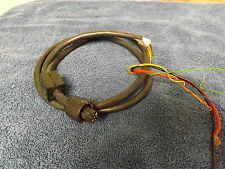 I am including a ST50 wire with a connector for this purpose. I am also including an original manual and a plastic sun cover. The only testing I can still do is power the ST50 and verify that the display is sharp as shown. Raymarine DSM25 E63070 Digital Sounder Module With Transducer. Condition is Used and unknown. Includes transducer but the wires were cut. Includes only what is shown in the photos. Free ground shipping to 48 states. For SeaTalk. for Sea Ray Boat Yacht! CANADIANS and OVERSEAS. Freshwater in as good a condition as I have seen in a while. It worked great when we we took it out no wires and no mounting bracket E7 chartplotter. Condition is Used. Shipped with USPS Parcel Select Ground. Use the included trunnion bracket to attach the radio to any console, bulkhead or overhead. The Ray52 boasts a wide array of standard features including NOAA weather alert, dual-watch, tri-watch, scanning, selective scanning, and much more. Raymarine R58057 4kW Pedestal Modulator PCB. We are Radar Marine Electronics, an authorized Raymarine dealer. 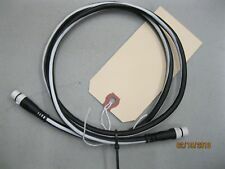 Raymarine E Series Network Cable 4598-003-N. Condition is New. Shipped with USPS First Class Package. We have a used but appears to be very nice condition Raymarine Wind Vane. Included is 35' of cable and plug at masthead>. The wind vane was donated and 100% goes to support Youth Sailing! You can check out our programs by googling "Santa Monica Bay Sailing Foundation". The Ray50 features both a noise-cancelling microphone as well as a premium quality speaker. Use the included trunnion bracket to attach the radio to any console, bulkhead or overhead. The Ray50 boasts a wide array of standard features including NOAA weather alert, dual-watch, tri-watch, scanning, selective scanning, and much more. For attaching Raymarine. 4000 mk2 Wheel Drive. It is compatible with Raymarine networked (SeaTalk) system if interfaced with a Raymarine ITC-5 SeaTalk Interface. Raymarine ST300/P371 (E23008) Through Hull Speed Transducer. Compatible with aluminum and fiberglass hull material and surfaces. Raymarine Raypilot Remote Plug & Socket Assembly M81181. Condition is New. Shipped with USPS First Class Package. These are used covers that fit the ST60. They do not fit the ST60 Plus! Owner removed because of an upgrade to onboard electronic's. Mounting Plate. - Mounting Hardware. Dragonfly 4PRO will change your underwater view. Change your underwater view and catch more fish with the Dragonfly 4PRO wide-spectrum CHIRP DownVision™ technology. Easily identify fish and underwater objects with photo-like sonar images. The warranty begins when you receive the item. Raymarine R70527 Axiom 7 Surface Mount Suncover 7"
Axiom 7 Surface Mount Suncover - 7". Raymarine Smart Controller Cradle & Belt Clip, A18117. Condition is New. Shipped with USPS First Class Package. This is a used Raymarine SeaTalk HS switch. In bench testing I uncovered an issue with the first port (marked with an X), all others have been tested and work correctly. If you only need 7 ports, this is the deal for you. Everything else except port 1 is guaranteed for 90 days from receipt, and free domestic returns, so you risk nothing. Unit is in good cosmetic condition as shown. No cables included, just the switch and it’s cover. FAST FREE USA SHIPPING AND COMPLETE SATISFACTION GUARANTEED! We offer 100% free US returns for ANY reason within 30 days. To help you get your items quickly, most items ship out same day as purchase if checkout is completed by 3PM Central. We ship purchases Monday-Friday, as well as most Saturday mornings. Part A80270. Transom Mount Transducer for CP100 Sonar Module. This ST70 display was removed from a boat being refit with new electronics. The unit is in good working condition and both Seatalk Ng ports are fully functional. We updated the software version on this display also. Raymarine C120 C80 C70 LCD Repair with Software Upgrade | 1 YEAR WARRANTY! This applies only to units that require installation at a later date. Any requests for this type of service will be ignored. This service takes an average of 2 weeks, but may take longer. This scanner is compatible with Raymarine Pathfinder and C&E-Series Classic displays. The warranty begins when you receive the item. INCLUDES Tiller pin, mounting socket, and deck mounted power plug. RAYMARINE ST2000 and Tiller Pilot. Part Number A12005. Raymarine Autohelm Series ST2000 Plus Tiller Autopilot. Part Number: A12005. This is a mic for the Ray55 VHF. It is old dealer stock, has a few marks on it as if it were used or maybe just from storage, not sure. Comes as shown, guaranteed working for 90 days from receipt. Unit only, no hanger. FAST FREE USA SHIPPING AND COMPLETE SATISFACTION GUARANTEED WITH 90 DAY WARRANTY! We offer 100% free US returns for ANY reason within 30 days. Beyond that, we will offer repair, replacement, or return for full refund should any operational failures occur within the 90 day warranty period. The warranty begins when you receive the item. To help you get your items quickly, most items ship out same day as purchase if checkout is completed by 3PM Central. We ship purchases Monday-Friday, as well as most Saturday mornings.